About a half an hour after we got settled into our blind along the tracks of the Tahquamenon Falls Riverboat Tours & the Famous Toonerville Trolley...Big Beulah showed up. She wasn't going to miss out the treats this weekend. Last weekend Momma Blaze and the cubbies got here first. We waited and waited and waited for Momma Blaze and the cubbies to come out. They finally came out to the north of us to eat corn around 10:00. Unfortunately we need to head back to the docks to beat the morning train of the Tahquamenon Falls Riverboat Tours & the Famous Toonerville Trolley. I have been promising Dixie that I would get her some new photos of the train for her brochure. Today was the chosen day...because hopefully we were going to have some sunshine...a train full of passengers. So we didn't get a chance to get too many shots of them...hopefully later. We also had some sandhill crane action along the tracks of the Tahquamenon Falls Riverboat Tours & the Famous Toonerville Trolley. The pair that has two colts was not happy with the four adults that were trying to feeding along the tracks. So daddy ran them off. Well after a photo shoot of the Tahquamenon Falls Riverboat Tours & the Famous Toonerville Trolley train arrival and riverboat departure...we headed back to the blind. I did get a shot of some of the sandhills that were hanging out in the marsh to the north of us....while riding on the speeder. Well, at least the midday train got a real show along the tracks of the Tahquamenon Falls Riverboat Tours & the Famous Toonerville Trolley. The cubbies were really showing off for them. But never made it down to us. And we had to follow the train back to the docks to leave Dixie the speeder and come back out with the train. So I guess we will have to hope for another chance to see them in two weeks when we get back up here. We headed back to our blind later than usual due to the heavy gloom and fog. Crew went back before us. As we neared the blind…there they were…Momma Blaze and the cubbies. OH MY GOSH!!! They were so adorable…the cubbies stood up behind their momma to see what they could see. They patiently waited while we unloaded our equipment and put away the speeder. I was able to get some shots of them from the tracks before I got up in the blind. Once we were in the blind momma gave them the ok to come get their treats. It was awesome. Then they gave me more opportunities for some sweet shots as they made their way down to the treats. They amazingly ate every scrap to the north of us…so Junior brazenly walked right by the blind. Then surprisingly Little Red came right along behind him. Then she stopped right in front of the blind and stood up curious of the clicking …she looked right up at me. I melted! What a precious beautiful cub. It was so cute…Little Diva got spooked and hid behind a tree. Finally they all went crashing into the woods across from the blind. Before too long, Momma came out…followed by the cubbies to eat the other treats to the south of us. While they were eating Big Beulah came out to the far north to eat corn. She was too far away to be a threat to the cubs. The cubs love to grab a treat and head back into the woods to eat. They did this several times giving many opportunities to shoot some sweet shots. Finally momma started to leave….no cubs followed…so she sat and patiently waited for them. Junior was the last to leave…but finally caught up with the rest…as they disappeared into the woods. About a half an hour later Big Beulah came out to the north of us…making her way down to us. When she discovered the treats were gone…she went over to the speeder to see if anything was there. Finally she wandered off to the east. After the morning train went through Momma Blaze popped back out down to the south of us….followed by the cubs. We discovered the train had dropped off some scraps of meat for them. They all had a little something then curiously Momma Blaze dug up a pile of grass. We finally realized that she was hiding the meat scraps from the eagles, turkey vultures and other scavengers. If it was covered up….the birds couldn’t see it from the sky. Eventually the cubs and Momma Blaze came back out and finished up the meat…so back into the woods they returned. We decided to head out, too. So...after my wonderful but brief morning on the Seney National Wildlife Refuge...I went back and picked up Mikie and we headed off to see our black bears. We decided it looked like Monday was going to be another wet day...so...off we went today to see them. Well, we had barely arrived when to the north came Big Beulah...and to the south came Momma Blaze and the triplets along the tracks of the Tahquamenon Falls Riverboat Tours & the Famous Toonerville Trolley. Well, Beulah beat Momma Blaze down to the treats. Momma Blaze got nervous. The winds were blowing so bad that she couldn’t smell or hear…her two major defenses against predators. So she told the cubbies to go back into the woods. Beulah ate a few treats then took a couple ‘to go’…and disappeared for the day. Finally Momma Blaze heard the left behind Little Red, crying and crying...so off she ran to check on her. Then out popped Little Diva running after momma. Momma stopped and gave her a sniff...making sure she was all right before heading into to check on Little Red. Shortly after...Junior also popped out and ran to find momma. Then the winds really picked up almost blowing us out of the blind. So we decided the storm was getting closer...and we needed to get the heck out of there. I think we made the right choice...the skies got really wicked looking as we pulled into the depot along the tracks of the Tahquamenon Falls Riverboat Tours & the Famous Toonerville Trolley. We got settled in the truck just before the clouds opened and it poured. Despite the wet gloomy morning...Momma Blaze and her triplets came out to see us along the tracks of the Tahquamenon Falls Riverboat Tours & the Famous Toonerville Trolley. Glad I had the extra day off...even if the weather hasn't co-operated. Just getting to spend time with these adorable cubbies...and the fighting eagles made it all worthwhile. We didn't have to wait long to see them...maybe about twenty minutes. I love when they pop out down from us...then trek the whole way down to see us...so I can photograph them the whole time. The cubbies don’t always walk single file behind Momma Blaze. Every now and then they like to go their own way. They have grown so much in the three weeks we have been away. Hopefully we will get to see them almost every weekend till the first of October now. I love the look on the cubbies faces...each one tells its own story. Junior...in the lead...is in full control. Little Diva is all about looking good. But poor Little Red...just doesn't like being so wet...so early in the morning. Little Diva was the show off today. She loved going in the high weeds to eat her treats and spy on what the other cubbies were doing. Our black bear Momma Blaze is so beautiful and such a good momma. It is so sad that her namesake...Momma Blaze the grizzly bear had to pay with her life for protecting her cubs as any momma bear would do. 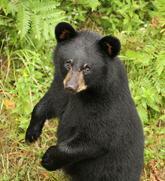 We are so thankful that the wild bears here have so much privately own landed so roam...over 3,000 acres. Hopefully such a tragedy will never happen to one of them….although if they cross the river...they are free game to be hunted or victims of uneducated intruders. We had a three year old eagle do a flyby...then this adult landed in a tree nearby...but too many leaves...so I manually focused so I could find the eagle. When the train came through two mature eagles swooped down to pick up meat scraps the engineer threw out. What a show the passengers got! Then after the train was out of sight…a 2nd year eagle landed to see if there were any pieces left. It found some…but then a 3rd year eagle came down and tried to take its treats…twice. Awesome! The clouds and rain just didn’t seem to want to let up…so we head out…but did get to see a pair of sandhill cranes with their very large colt in the marsh. Despite the weather…a great day along the tracks of the Toonerville Trolley. We were so excited to find Momma Blaze and her triplets popping out shortly after we had just gotten settled in the blind. She and the cubbies came down to quickly see us…then off into the woods never to return. We were very surprised to have a 2nd year bald eagle flying down the tracks from the north…straight over us. Not long after they left…out popped one of the quads from two years. It was Little Princess. She ate a little then got nervous. Out popped another one of the quads…Darth. Princess took off as Darth came closer. They played hide and seek for a while before finally disappearing. Then our next visitors were the sandhill cranes. The territorial pair was out to chase an intruding pair off. Lucky for me they came right down the tracks right toward me. They actually got chased out several times before finally getting the point. It was an overcast morning as we head down the tracks of the Toonerville Trolley. The mosquitoes were already wide awake and hungry at 7:30a.m. As we neared the #1 station two large turkey vultures greeting us. We got back to the blind using Michael's new invention for getting the speeder off the track quicker. Once we get the 'turntable' and aluminum track we'll be golden...I may be even able to do it. Shortly after we settled in the sandhill cranes flew in to the north of us. Then out popped a young bear probably about two years old. It lied down and enjoyed the corn. Then just before crew showed up...out came Momma Blaze and her triplets at #2 station. They ate the few donuts we left for them...then stood up looking as crew headed their way. They ran into the woods as the crew came toward them...then came back out to see what crew had dropped off for them. After they had their fill they wandered into the woods for a rest. But it wasn't long before Momma Blaze brought them out and down the tracks to us. It was time for dessert. It was great to have a chance to photograph them as they huddled close to momma allowing for some nice photo ops. Each of the cubbies grabbed a treat...one by one...and head into the woods. When momma got her fill she wandered into the woods to join them...but didn't come back out again that morning. The young bear took off into the woods as the crew drew near to it...the territorial sandhill cranes had a little squabble with another pair of intruders. We did see a broad-winged hawk, ruffed grouse and bunny...but that was it for the day as we headed out. Sadly we won't be back for two weeks. We wish Momma Blaze and the triplets safe travels till we return. We headed out of the depot around 9:00am to blue skies but a brisk wind. We were excited to find a pair of sandhills with two tiny colts as we were leaving. As we neared #1 station we found our eagles soaring overhead with their buddies the ravens, gulls and turkey vultures. The territorial sandhill was feeding to the north of the blind. It was very quiet morning. A broad-winged hawk flew through...red squirrels and chipmunks running around....blue jays chattering...a few warblers flitting around...actually quite a peaceful place to spend some time. The ravens, gull, turkey vultures and eagles were soaring all around the area...enjoying the strong northeast winds...which helped keep the mosquitoes in control. We finally thought it was going to be a no show day for any bears...when out of Spring Hill came Momma Blaze. We were so happy to see her right at the blind. But...it was even more exciting when we watched first one...then two...then three little cubbies come out of the trail to their momma!!! How awesome to be able to see these tiny guys so soon...and so close. Thank you Momma Blaze for allowing us to be the first to see these precious cubs. They ate for a while with the cubbies running in and out. Unfortunately, my battery died on me right in the middle of all the action...so I missed some adorable shots...that Michael made sure I knew about. URGGHHHH! Then all of a sudden Momma Blaze whirled around and quickly went into the wood. Then from the east side of the track out came a big coyote. Yep...she knew something was a miss. We had hoped to see her back out...as the coyote disappearedd. But unfortunately she didn't show back up till later...and farther away. We then had another young coyote come out from the north of us. It wandered downt the tracks then disappeared into the west. Another pair of sandhills flew in to feed to the north of us...then a single sandhill wandered in. A doe crossed way to the north of us. It's great to see deer out and about. When we spotted Momma Blaze down at #2 she came out with the three cubs. But they went into the east...probably to rest. She came back out and settled down to 'guard' the area. One of the coyotes came out and headed down the tracks toward #2. Blaze immediately came toward it. They had a little stand-off then the coyote ran into the west and Blaze went after it. She came back out a little later and continued to monitor the tracks....after checking on her cubbies. That was the last that we saw of her...but then the sandhill cranes entertained us. The single one walked almost all the way down to us. Then the pair decided to come our way. The single one got worried and walked into the woods. The pair came right down to try to scare it. Then all of a sudden the territorial sandhill came flying in and chased off the pair. The single one thought it was safe to come out...but found the terrtiorial male. The both went into the woods with the territorial sandhill bent on running the single one off. It wasn't too much longer that the single one came flying out of Spring Hill to the south of us...closely followed by the territorial male. Always something fun to watch and experience here along the tracks of the Toonerville Trolley. We left around 3:30...excited about returning next Sunday to see if we can get some more close up time with Momma Blaze and her adorable triplets.